RDM6300 125KHz card mini-module is designed for reading code from 125KHz/ 134.2KHz card compatible read-only tags and read/write card . It can be applied in office/home securitypersonal identificationaccess controlanti-forgeryinteractive toy and production control systems etc. RDM6300 Series non contact RFID moduleuse the advanced RF receiving circuit and embedded MCU designcombing with high efficient decoding algorithmto finish the data receive of EM4100 and all the compatible cards. This is a very popular RFID card read module for arduino usersit can read 125K EM4100 series RFID card. 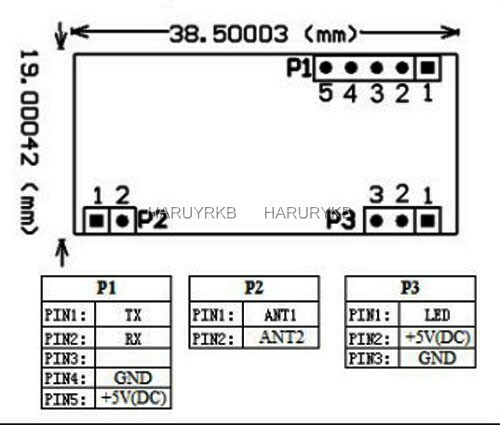 This module is easy to useserial port connect to arduino MCU after power upwhen RFID card enter into card reading rangethis module will send the card number to arduino by UART You can further connect relay arduino shield to your arduino in order to enable the simple door keeper controlling system. Note:This module is easy to useserial port connect to arduino MCU after power upwhen RFID card enter into card reading rangethis module will send the card number to arduino by UART You can further connect relay arduino shield to your arduino in order to enable the simple door keeper controlling system.